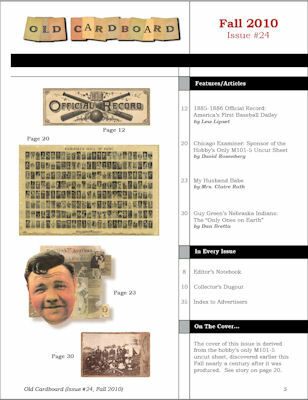 The cover and table of contents for Issue #24 are shown below. 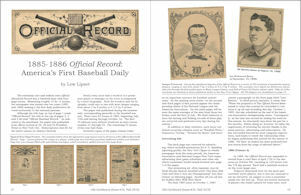 1) "1885-1886 Official Record: America’s First Baseball Dailey" by Lew Lipset. 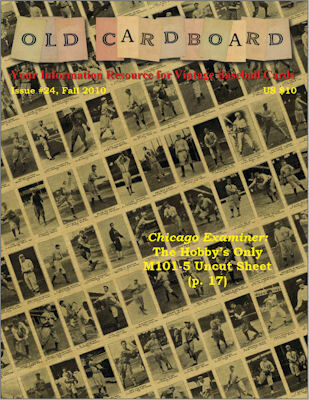 Another solid contribution by hobby veteran Lew Lipset, who provides details about this important early baseball newspaper. 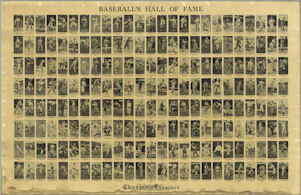 The paper not only provided important player statistics used by today's historians, but printed a series of 200 woodcuts of nineteenth century players. 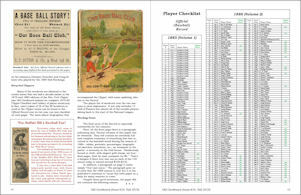 A complete checklist of all 200 woodcuts is included. 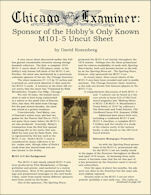 2) "Chicago Examiner: Sponsor of the Hobby’s Only M101-5 Uncut Sheet" by David Rosenberg. Author Rosenberg reports details of his research on this recent discovery that reveals a previously unknown sponsor for the M101-5 set. 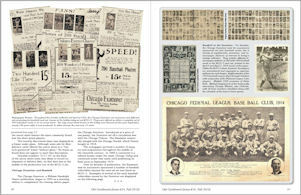 A high-resolution image of the complete sheet is displayed across the magazine centerfold and new information is provided about other cards and memorabilia produced by the sponsoring newspaper. 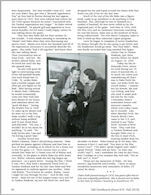 3) "My Husband Babe" by Mrs. Claire Ruth Reprint of an article that first appeared in the November 1974 issue of Argosy, a men’s magazine with roots dating back to 1882. 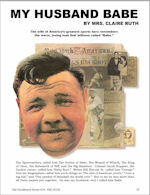 The article was penned by Bert Randolph Sugar, then Editor-in-Chief of Argosy based on multiple interviews with Babe Ruth's wife in which she reminisced about some of the couple’s social life. 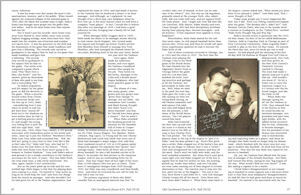 This is her story as documented by Bert Sugar. 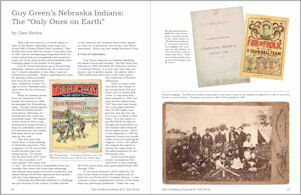 4) "Guy Green’s Nebraska Indians: The 'Only Ones on Earth'" by Dan Bretta. 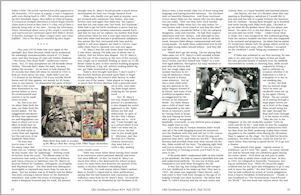 Nebraska native and current resident Bretta provides details of his longtime interest in this barnstorming baseball team that was popular throughout the early years of the nineteenth century. 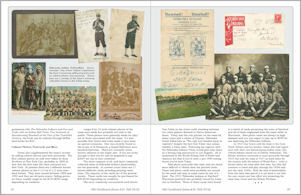 Focus is on the two pamphlets written by the team's owner, as well as a trail of postcards, cabinet cards and other memorabilia known to today's collectors.